Speaking of Tyler Zeller, he was clearly one of the most impressive big men prospects in this study, as he not only shouldered a fairly heavy offensive load (14.4 possessions per game, 7th among the 26 evaluated), but did so very efficiently (1.086, 4th best). He ranks as the second most efficient scorer (1.673) in transition situations after Meyers Leonard, despite seeing twice as much usage in that category. Zeller saw the third most possessions in this study with his back to the basket, and drew fouls at the 4th best rate once there. While not taking all that many jump-shots (just under one per game), he ranked as the 4th best shooter among the 26 big men, at a solid 1.031 points per shot. His versatility will clearly be an asset for him in the NBA. Mike Schmitz takes a look at the strengths and weaknesses of Tyler Zeller with the help of North Carolina game film, UNC Head Coach Roy Williams, Jay Bilas, and Zeller himself. Coming into his senior season, Tyler Zeller was a part of a North Carolina team that had high preseason expectations of winning a national title, thanks an extremely talented roster full of top-shelf NBA prospects. The Tar heels ended up earning a number one seed in the NCAA tournament but lost last weekend in the Elite Eight to Kansas, ending Zeller's collegiate career. After a successful junior year, Zeller continued to make strides as a senior, establishing himself as perhaps the Tar Heels most consistent player and earning ACC Player of the Year honors. 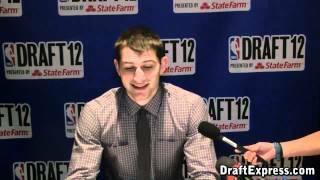 While he was considered a likely mid to late first round pick in the 2012 NBA Draft coming into this season, Zeller's impressive senior campaign helped elevate his draft stock to the point that he now has a strong chance of being picked in the lottery or perhaps even the top ten. His intrigue from NBA standpoint starts with his physical profile, as he's a solid run and jump athlete for a 7-footer, showing great speed running the court, as well as the ability to finish above the rim. Somewhat upright in his stance and not overly fluid, his frame could still use some extra bulk, but he's made progress in that area since coming to North Carolina, and he should continue to add strength as he puts in the work in the weight room. Zeller combines his outstanding running ability with a nice set of hands and a good motor for a player his size, both of which help him as a finisher sprinting the floor. He's able to beat most any big men down the court and catch the ball running full speed, where he's then shown the ability to quickly gather himself and elevate for a dunk, resulting in him converting on an excellent 79% of his field goal attempts in transition this season. In the half-court, Zeller does much of his damage in the post, where he looked to be more assertive and confident as a senior, fighting to establish position and calling for the ball. His bread and butter is still his right-handed jump hook turning to his left shoulder, which he executes effectively from either block and can even shoot from a bit further out, depending on how deep he catches the ball. He'll need to continue to refine his post game, working on his footwork and mixing up his repertoire a bit, but he did show flashes of some counter moves and looks to have good touch finishing with either hand around the rim. He'll also need to focus more on feeling defenders collapsing on him and finding open shooters, as his passing out of the post is still lacking at this stage, only generating an assist on just 7% of his used possessions. Due to the way he was utilized offensively at North Carolina, Zeller didn't get to show much in terms of his shooting ability, attempting less than one jumper per game in his senior season. He connected on half of those attempts, albeit in a very limited sample size, and looks like he should become a reliable shooter out to about eighteen feet or so in time. He shot an excellent 81% from the free throw line this season, has solid mechanics, and a quick release, which all bode well for his potential to space the floor and pick-and-pop as he gets more comfortable with his jumper. Defensively, Zeller may lack some girth to defend bigger NBA centers and isn't the most imposing rim-protector (his 2 blocks per-40 minutes ranks 11th of the 15 centers in our top 100 rankings), but he's a very cerebral defender who understands positioning, both defending the ball and in help situations, as he does an excellent job drawing charges. He'll likely never be considered a game-changing defender at the center position, but his smarts and instincts should enable him to fit into a defensive scheme, where he has the potential to excel defending ball screens and making the proper rotations. Perhaps the area we've noticed the most improvement in Zeller over the past year has been with his toughness and willingness to embrace contact in the paint. We noted before that he seemed to be a bit soft at times and was muscled around on occasion, but he showed more of a mean streak this year on both ends of the floor. After being a below average rebounder for three seasons, Zeller improved dramatically as a senior, showing great activity on the glass on both ends of the floor and grabbing 13.6 rebounds per-40, which was the highest of all centers in our top 100. Overall, Zeller had a very impressive senior season at North Carolina, solidifying his strengths and shoring up some of his weaknesses. He improved each year since arriving as a freshman and also earned Academic All-American of the Year honors this season, further exemplifying his strong off-court intangibles. The fact that he's already 22 years and doesn't have elite length or athleticism likely limits his upside in the eyes of NBA decision makers, but 7-footers who can rebound, run the floor, and score in the post are always highly coveted by NBA teams, and Zeller looks to have the potential to make a contribution early in his career if he's drafted by the right team and given the opportunity. Following two injury-plagued seasons, Tyler Zeller has emerged as the leading scorer on a talented North Carolina team as a junior. Although he may not possess the upside of teammates John Henson and Harrison Barnes, his solid play has caught the attention of the many NBA scouts watching the Tar Heels this season. Starting at the center position, Zeller is extremely mobile for a player his size, which fits perfectly into North Carolina's up tempo system. And while his team has had some struggles this season, Zeller has probably been their most consistent performer, highlighted by his 27 point, 11 rebound effort in a win against Kentucky, and a 24 point, 13 rebound effort against Duke this week. As we've mentioned before, Zeller has the physical tools to stand out at the college level, as there aren't many players with his combination of size, mobility, and skill level. While not a top-shelf athlete, he runs the floor well and is able to elevate to finish and compete on the glass. His lack of physical strength is still his biggest weakness from a physical standpoint and area where he should really focus. It's hard to imagine him playing center in the NBA with his frame right now, but if he's able to add some strength, that may be where his game is best suited. Just over 42% of Zeller's offensive possessions this season have come of the post up variety, and while he's shown that he's capable of scoring in the block, he still lacks some polish. His go-to move is his jump hook turning to his left shoulder from either block, which he executes effectively for the most part, but he sometimes forces the issue and shoots it from too far away or without reading the defense. He has managed to cut back on his turnover rate this season and get to the free throw line more often, which are both encouraging signs, but with his skill level and touch around the basket, he should be more efficient on the block than the .92 points per possession he's scoring this season on post up opportunities. Zeller hasn't shown a whole lot in terms of his ability to shoot the basketball, as he's attempted less than one jump shot per game so far this season. Much of this can likely be attributed to him knowing his role and focusing on his strengths in the basket area though, as he seems to be a better shooter than what he's shown so far at North Carolina. He has a quick release and high release point and seems comfortable shooting the ball out to about 18 feet or so, and the fact that he shoots a solid 76% from the free throw line further demonstrates his potential in this area. When projecting him to the NBA, Zeller will likely need to spend more time facing the basket, whether it's off the pick-and-pop or just spacing the floor for dribble penetration. The biggest issue with Zeller's NBA prospects is figuring out who he'll be able to defend. He does appear to be a guy who will put a solid effort in, but he gets muscled around at the college level, and his underdeveloped body would show up even more in the NBA. His lack of lateral quickness also hurts him covering the perimeter, making him vulnerable to quicker big men facing him up. Furthermore, he doesn't appear to be the toughest guy around, something that shows up in particular on the defensive glass, where he ranks just 38th of the 43 collegiate centers in our database when adjusting for minutes and pace. Overall, there are quite a few positives for Zeller and draft stock. With teams always searching for quality big men, he is a very intriguing prospect with his combination of size, mobility, and emerging skill set that shows room for growth. He's shown this season that he's an effective scorer who seems to know his limitations and can fit into a team concept, and if scouts believe he's capable of improving his body, adding polish to his post game, and continuing to develop a reliable mid-range jump shot, he'll be a player who NBA teams will likely consider in the first round of the draft, whether it be in 2011 or 2012.